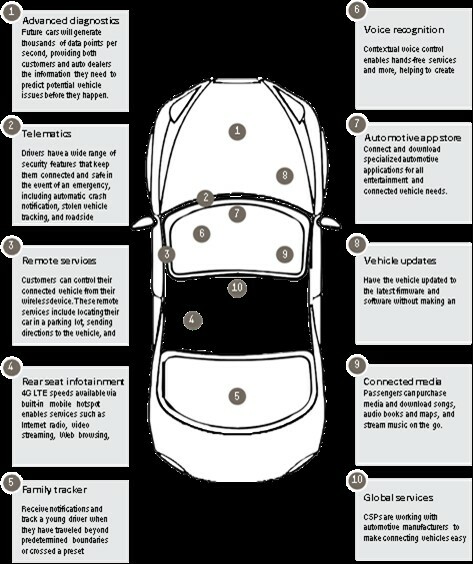 Every major auto manufacturer is committing to the connected car in some way. What “connected” means is likely to vary according to which manufacturer you talk to, but there’s little doubt we’ll see cars get more sensors, more apps, more in-dash control systems and more automation. According to Gartner, one in five cars on the road will be self-aware enough to discern and share information on their mechanical health, global position and status of their surroundings. Industry-wide growth is expected to stay at 30% annually between now and 2020 as a result. Less clear is how we’ll take advantage of the technology that’s working its way into millions of new vehicles. Making cars smarter is one thing; we also need to improve the IQ of roads, cities, bridges, garages, traffic systems, and more so that connected cars have things to connect to. At Hewlett Packard Enterprise, we’re helping to usher in a smarter driving experience with a unique combination of technologies, expertise and partnerships. Beyond the basic concept of a connected vehicle equipped with Internet access, new markets have emerged, such as vehicle-to-infrastructure (V2I), vehicle-to-vehicle (V2V), vehicle-to-cloud (V2C), vehicle-to-pedestrian (V2P) and vehicle-to-everything (V2X). A recent study by the Centre for Automotive Research highlighted that “the average car now contains 60 microprocessors, and more than 10 million lines of software code — more than half the lines of code found in a Boeing Dreamliner airplane.” Cars are becoming increasingly intelligent, and by 2018 one in five cars on the road will be self-aware and able to discern and share information on their mechanical health, global position and status of their surroundings. This self-awareness, together with the need to be constantly on, requires reliable connectivity and internet of things solutions. The rollout of 4G LTE, and subsequently 5G networks, will further increase the capabilities of the connected vehicle, and facilitate faster transmission rates and higher volumes of data. Tier-1 communication service providers and telcos are ideally suited to provide such connectivity while needing an IoT solutions partner to address the automotive needs. The car of the future will be safer for passengers and other road users. V2V and V2X communications coupled with high-speed analytics will make this a reality, and introduce heretofore unimaginable conveniences. Just imagine being able to pay for gas and parking charges from your car. And with analytics built in, the connected car will be able to offer not only pay-as-you-drive insurance, but also pay-how-you-drive insurance — rewarding good drivers and penalizing bad driver behavior. When cars are connected, the entire ownership and driving experience is more integrated and engaging. To fulfill this vision, onboard systems need to do more than just compute. They also need to collect, collate, translate and share data instantly to enact what we call microservices. Think of a driver heading for a bridge two miles away. The wind sensor on the bridge is recording the wind speed and direction. If this data is transmitted to the cloud, the connected car platform can recognize if that wind will impact handling and provide the driver with advance warning of the hazard and in plenty of time to take action. Or think of how telematics information shared between vehicles, using a concept called swarm intelligence, can give drivers accurate, real-time information on road and weather conditions. You may not know a patch of black ice is stretched across the roadway ahead, but tire sensors connected to the onboard systems in the cars ahead will detect the loss of traction. With shared telematics and swarm intelligence, those vehicles could broadcast sensor data for others to consume and analyze, allowing your connected car to automatically adjust systems and reduce the risk of losing control. Changing gears or increasing traction, for example. In each case, connected car platforms gather and translate data — from devices with connectivity as diverse as 4G LTE or 3G/2G cellular, and low-power wide-area network technologies such as LoRa and Sigfox — to form insight that can then trigger hundreds of unseen but vital actions. Connected car services are still an optional extra for many cars, but they are fast becoming a standard item, even in family sedans and hatchbacks. Here at Hewlett Packard Enterprise, we recently worked with IAV, a leading automotive industry engineering consultancy to create a fully-functional proof of concept for testing the ways connected sensors from vehicles and infrastructure can optimize the driving experience — from real-time monitoring of weather and road conditions to warn against approaching hazards to checking to see if your garage is already occupied to collecting data about the state of the road surface for the relevant authorities. Connected car services can change how we drive, and keep us safer as a result. But they’re also like any other networked technology in that the more nodes that connect and share data, the more useful the entire system becomes. That’s why analysts expect such big growth in this market and why companies are trying to simplify connected services development and deployment. A fully intelligent driving machine may not be here yet, but it’s also closer than most of us think.